Oh glorious day, caloo, callay! 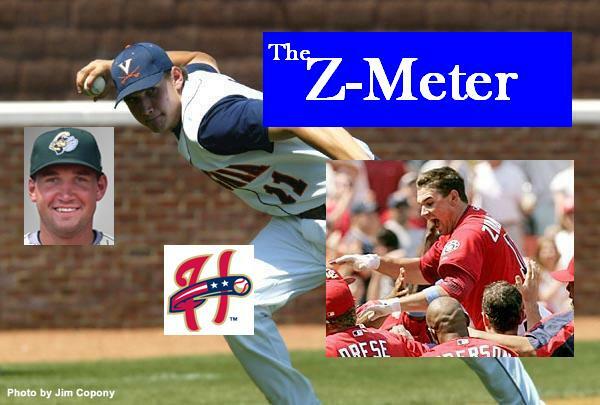 (Sorry, I have a five-year-old, must be too much Dr. Seuss) Both Jay Bruce and Clayton Kershaw cashed in their golden tickets this week, so we’re sending up the Z-meter a couple days early in celebration. Time to find someone new to fixate on – I plan to obsess over Ian Stewart now, personally. I’m adding a couple of statistical marvels from the minor-league ranks to take the place of our two stalwarts who have gone on to their reward. Nelson Cruz has a ridiculous .705 slugging average for Oklahoma Redhawks (Rangers), and Jhoulys Chacin is mowing down batters for the Asheville Tourists (Rockies), with eight wins and just one loss (check out his ridiculous strikeout numbers below). Welcome, fellas. UPDATE: Reader Will, a minor-league road tripper extraordinaire, has been lobbying for the inclusion of Chase Headley, and he’s right, the Beav needs to be here. Added. The top level. These prospects are in AAA in the prime of their youth, and ready for the call that will change their lives. These guys also have the potential to skip straight to the majors, but are more likely to get promoted to the top of this meter first. Prospects chosen from Diamond Cutter’s Top 25, Baseball America, and my own irrational sense of whimsy. Nice to meet the new guys. Plus I’m always happy to learn a new name. Jhoulys? I like it. I still say Headley deserves inclusion here (but I promise I’ll let it go after this). He started out dismally at Portland, but now he’s up to .302/9/26 and the OPS will be above .900 any day. And San Diego su-uh-uh-ucks. They’ll be bringing him up soon. You’re right about Headley, of course. I guess I’m guilty of assuming that he won’t be around long, so why add him? I think it’s fairly clear that Ian Gac is my new man-crush, but Travis Snider is probably going to get a lot more attention from me in the next few months. Comments like that make me wonder what the hell kind of site we’re running here. Great article, Bruce. Thanks for passing it along. I wrote about it today. Re: Headley, according to this article it could be a while before we get to see him in a Padres uni. They’re worried about his arbitration clock, and Kevin Towers is poor-mouthing. I’m sold, Will. He’s in there. Masterson is on Pawtucket now, after his spot start (and 1st major-league win) for Boston. Oh, shoot. You already wrote about Masterson. I’ll go stand in the corner. No shame here. The boy is yo-yoing so much, I can’t keep track. I had him in the wrong place twice before I figured it out. By the way, it’s nice to see that the Rocks are trying Ian Stewart at second base. Three games now without an error (and he’s started hitting too). I’m guessing he’ll be a little rough on the pivot, but it’s cool that he might have a job. And seriously, his nickname should be Boogie, if it isn’t already — after the Led Zeppelin song “Boogie with Stu” (a jam with legendary boogie-woogie piano player Ian Stuart, a frequent Stone). Seriously. I mean it.